Unless you live under a rock, you probably heard the latest news: Toronto will now accept a whole lot more plastic in the Blue Bin – yay!, Bruce Jenner is absolutely smashing as Caitlyn – also yay!, and the Pan Am games are going to jam Toronto’s already tangled traffic – yay to the games but boo to the traffic. We know what happens when a city fails to plan for such an event. 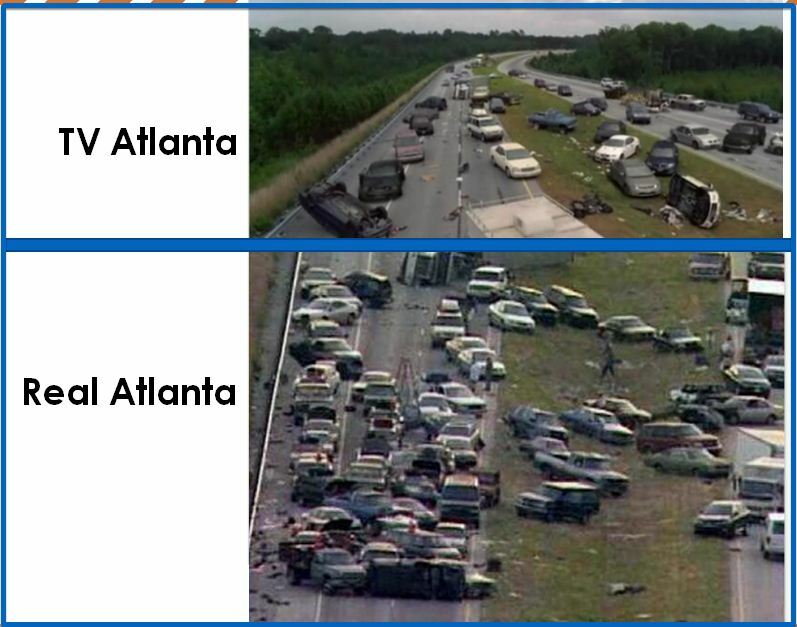 This happened way back when in Atlanta, Georgia for the 1996 Summer Olympics (also known as an ‘unmitigated transport disaster‘ and cautionary tale to all subsequent event planners around the globe). Take a car-loving town like Atlanta, add a massive event like the Summer Olympics, subtract any traffic planning, add a storm and the whole thing equals real Atlanta looking just like fictional Atlanta on the zombie apocalypse TV show “The Walking Dead” … which also happens to film there. Luckily, we have a plan! Pan Am games in Toronto mean traffic changes will be in effect from June 29 – August 18. UHN’s Emergency Preparedness department even has a special Pan Am page. My favorite part is that a whole bunch of transit authorities around the GTHA united for a good cause. Anyone with tickets to any Pan Am or Parapan Am event can ride any of our surrounding transit systems for free. Yes, you can take a Go-train, transfer to the TTC all for nothing more than flashing your game event ticket. Not only that, public transit will be enhanced for spectators during the Games. “Service will match the Games schedule to help you get to and from events, and many of the region’s public transit agencies will add and extend services during the Games.” according to the Pan Am FAQ site. There’s more to the plan than just increased transit. Look for more temporary HOV (high occupancy vehicle) lanes, and HOV means 3 people, not 2. The real goal is all forms of sustainable transportation … basically anything but the dreaded SOV (single occupancy vehicle). Think carpooling, cycling, running, walking, telecommuting. Grab a pogo stick if you must. UHN is working with our friends at SmartCommute Toronto to help staff practice the 4 R’s way before the games to keep everyone moving. RE-TIME: (if possible) Shift workday earlier or later to avoid peak times. Try a compressed work week. And now that we’re ready, let the games begin! This entry was posted in Beyond Talkin' Trash and tagged active transportation, biking, cycling, Pan Am, public transit, smartcommute, sustainable transportation, walking. Bookmark the permalink. On Green Procurement and Others ...My 12 weeks at UHN's Energy and Environment dept.